In the wake of last week's global ransomware attack, the time is now to make sure your computer operating systems are updated or upgraded. 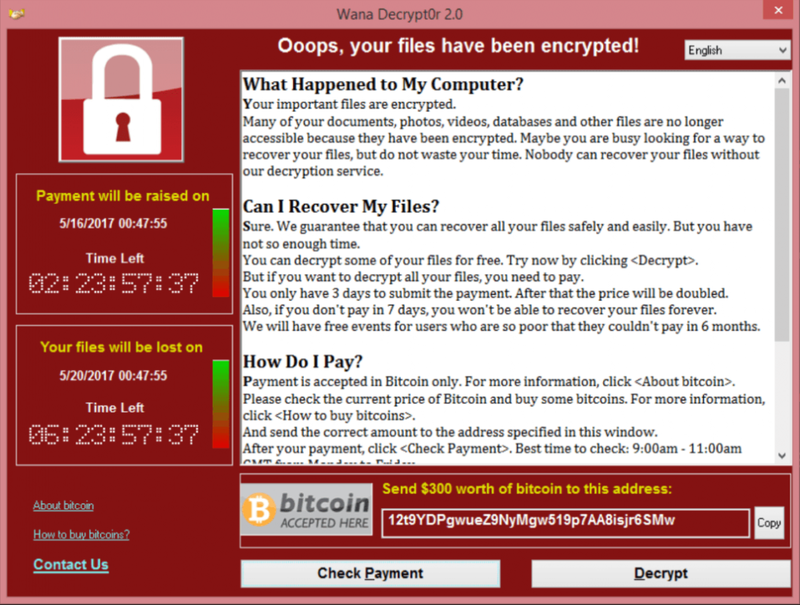 The WannaCry ransomware program spread globally very quickly. It was able to compromise computers still running the Microsoft Windows XP operating system along with versions of Windows 8 and older versions of Windows Server. The ransomware demands $300 in bitcoin payment to unlock the files that it locks by encryption. XP was launched in 2001 and the software is no longer supported. Microsoft, however, issue an emergency patch for XP and other versions of Windows which are no longer supported to close this particular exploit. Cyber security experts say it's possible that more infections will occur. There are likely small businesses out there who are still running old operating systems on their servers. The patches released over the weekend by Microsoft are at these links if you have: Windows XP SP2 x64, Windows XP SP3 x86, Windows XP Embedded SP3 x86, Windows 8 x86, Windows 8 x64, Windows Server 2003 SP2 x64, and Windows Server 2003 SP2 x86. If you need help of course, contact us. Here we have more information malware and antivirus services. This latest computer security threat also reinforces the need for you to take action now. Make sure you have safe and secure current backups of your critical files and data. We urge you to make multiple backups to physical HDD or SSD drives or to cloud services regularly. It’s also good idea to back up files to a drive that is not connected to your computer network. Make sure your employees are trained on proper handling of emails. They should never open an email attachment that is suspicious. They should not lick on email links which look suspicious either. Make sure you have antivirus and anti-malware software running on every computer on your network or stand alone computer. If you are hit by malware, disconnecting the computer from the network and even immediately shutting down your network can prevent the spread of the malware. If you are locked out of your files after being infected, both cybersecurity experts and law enforcement discourage paying ransom as it promotes further attacks. Plus, there is no guarantee that all of your files will be restored. Which highlights the need to make sure you have regular backups onto devices not attached to your network. A technology geek for years, Tom is also a professional journalist and videographer after working for over 30 years in radio and television in Wisconsin, Texas and Illinois. For 10 years he served as News Director for KTAB KRBC TV in Abilene, Texas. He personally uses 7 technology devices (smartphones, laptop, tablet, desktops) on a daily basis.